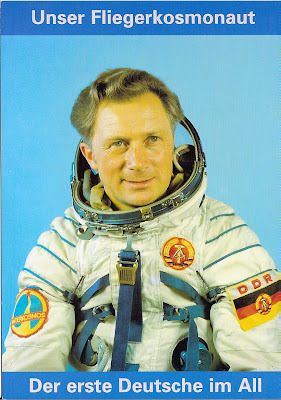 In 1978, Lt. Col. Sigmund Jähn, a pilot and scientist for the Luftstreitkräfte der NVA (East German Air Force), became the first German in space. He was one of the first trainees of the Soviet Intercosmos program, and was the third Warsaw Pact cosmonaut to go into space (after Vladimir Renek from Czechoslovakia and Miroslaw Hermaszewski from Poland). Jähn, along with soviet cosmonaut Valery Bykovsky, were crewmembers on Soyuz 31. Their mission included docking with the Salyut 6 station. The cosmonauts returned to Earth aboard Soyuz 29. Happy Birthday to me!!! Woo-hoo!!! Small world. That's my b-day, too, though two years later in '73. Always good to know about milestones on your birthday. Small world indeed .... Happy (Belated) Birthday, John!!! !